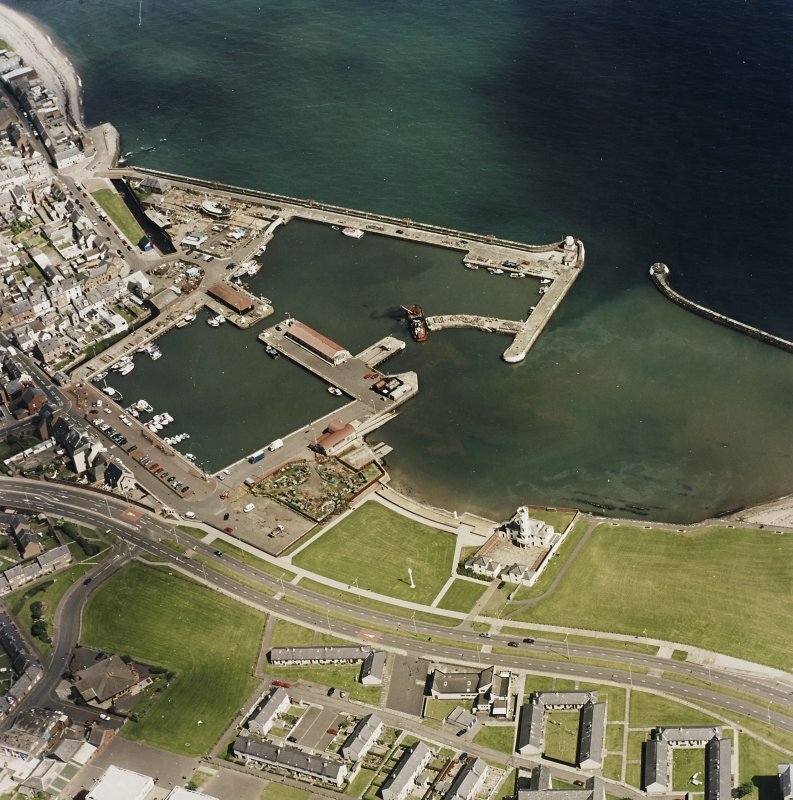 Oblique aerial view centred on the harbour, taken from the NW. 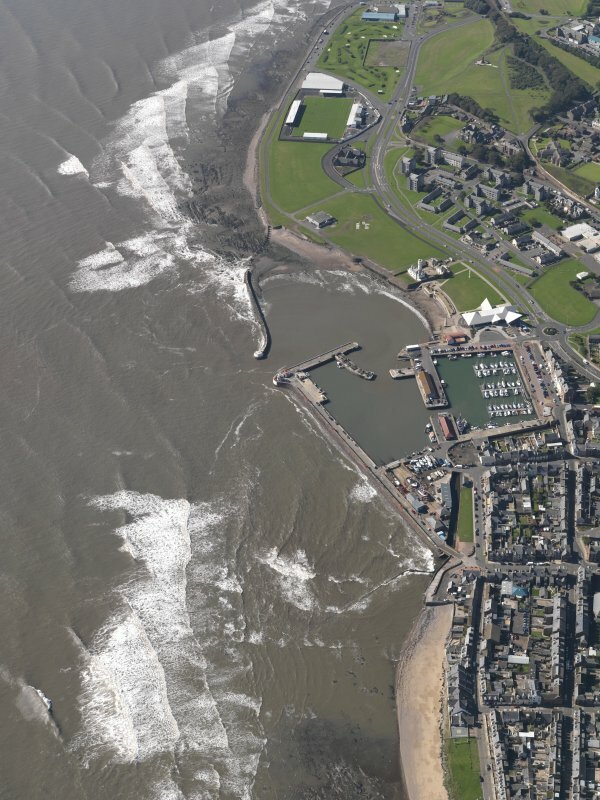 Oblique aerial view centred on the harbour and signal station, taken from the WSW. 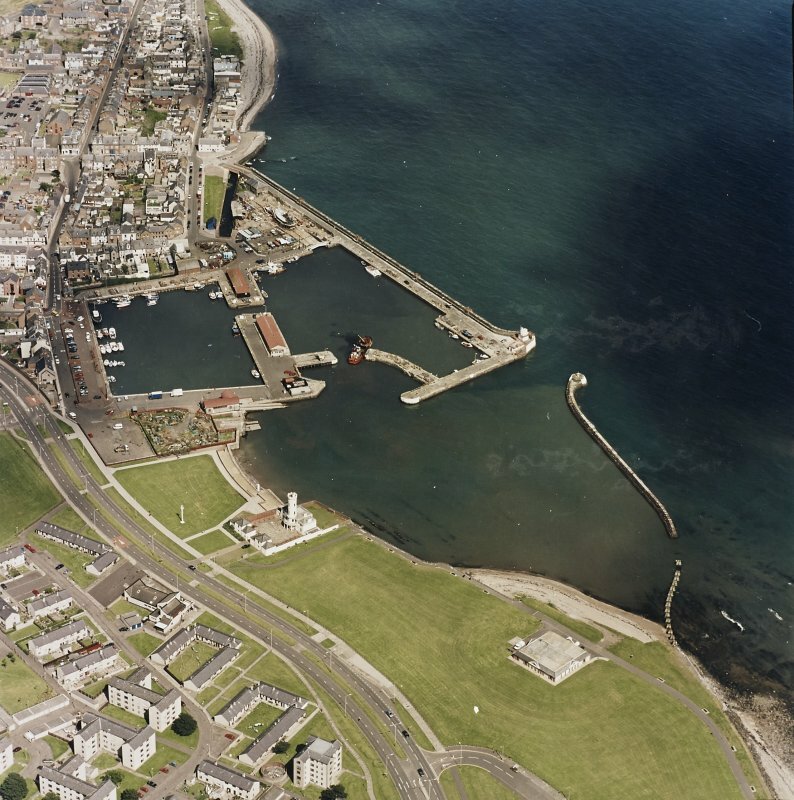 General oblique aerial view of the harbour area, centred on the lighthouse, taken from the E.
Oblique aerial view of the lighthouse, taken from the N.
Oblique aerial view of the lighthouse, taken from the ESE. 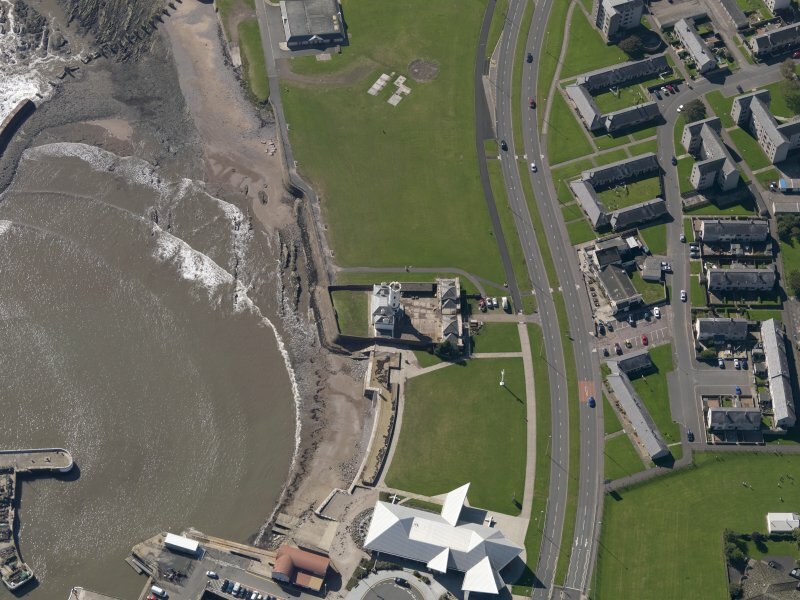 Oblique aerial view of the lighthouse, taken from the SSE. Oblique aerial view centred on the harbour and signal station, taken from the WNW. 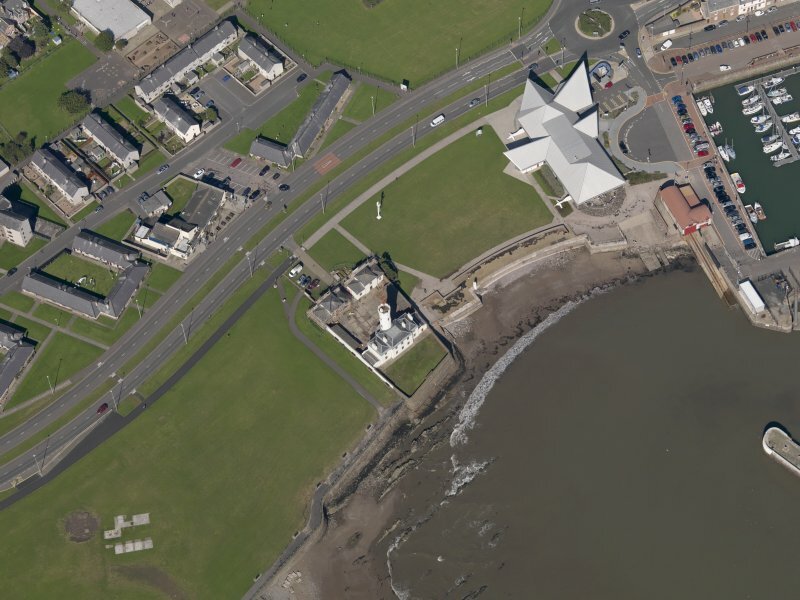 Oblique aerial view of the lighthouse, taken from the SSW. 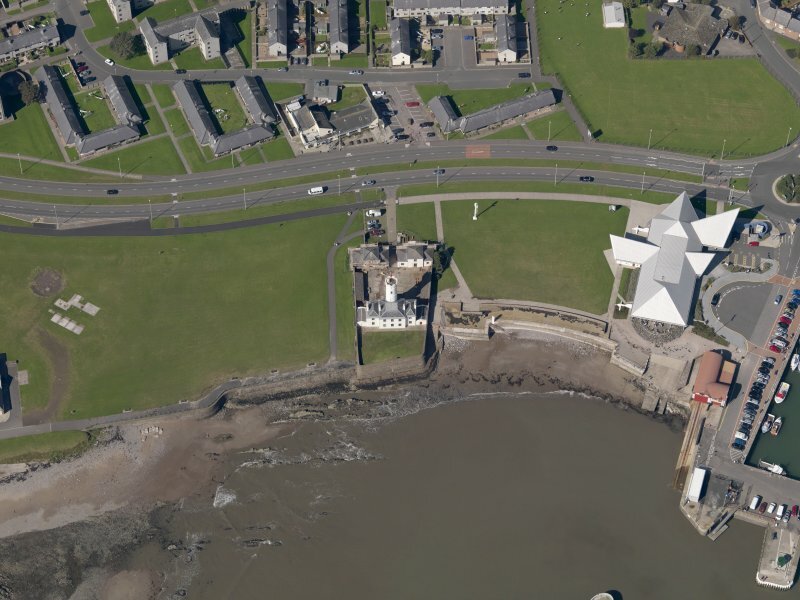 Oblique aerial view centred on the harbour and signal station, taken from the SW.
Oblique aerial view of the lighthouse, taken from the NE. 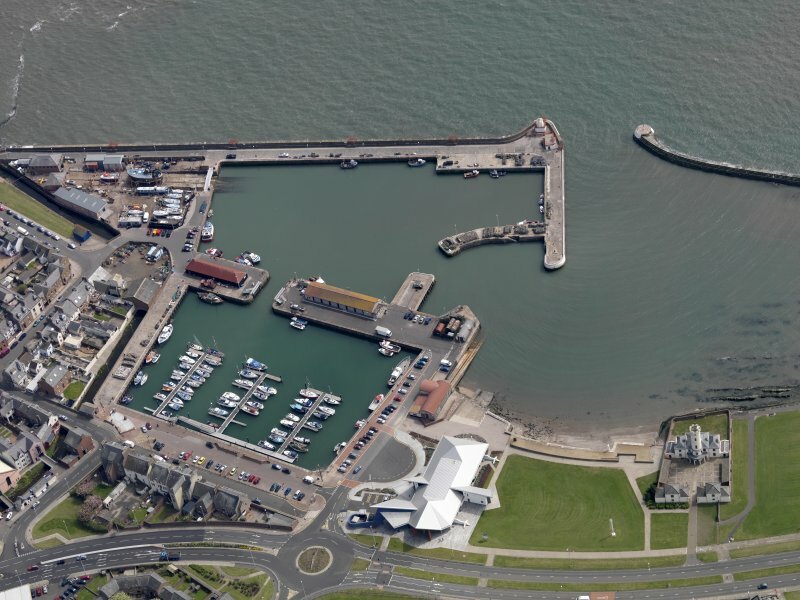 Oblique aerial view centred on the harbour, taken from the WNW. View from W showing NW front of NW buildings with tower in background. View from NW showing NW front of NW buildings with tower in background. View from NW of main entrance to Signal Tower. 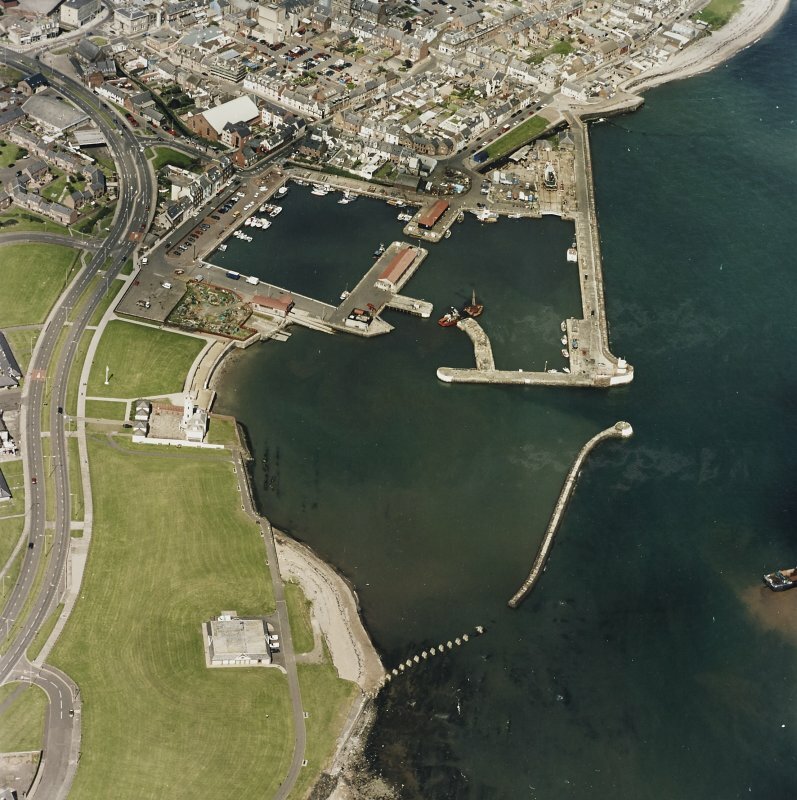 General oblique aerial view of the harbour arealight, centred on the lighthouse, taken from the NE. For (associated) Bell Rock Lighthouse (NO 7625 2705), see NO72NE 1. (Location cited as NO 641 404). Bell Rock lighthouse signal tower, Ladyloan. Built 1814. 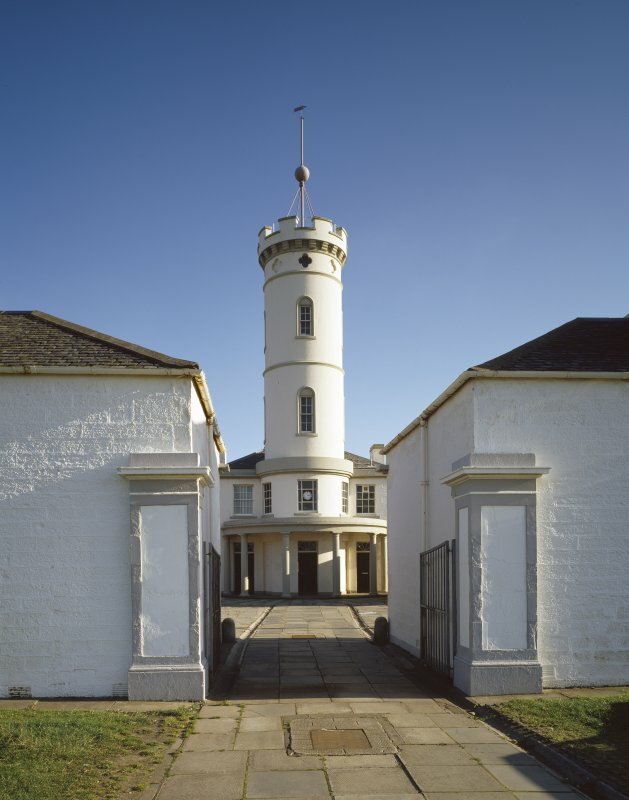 A four-storey tower with a battlemented parapet on a two-storey classical base in a courtyard of single-storey buildings. Now a museum. This site has only been partially upgraded for SCRAN. For full details, please consult the Architecture Catalogues for Angus District. Bell Rock Lighthouse operation shore and signal station designed and completed under Robert Stevenson’s direction in 1812. The building of the Bell Rock Lighthouse 19.2km south-east of Arbroath was one of the major engineering feats of the early 19th century. The lighthouse is of the 'lit rock-tower' type, that is, it is a wave-washed structure with the entire accommodation provided within the tower that supports the light The site was submerged every high tide. The working season was limited to four months per year, yet the building took only four seasons to complete, coming into service in 1811. The story is a remarkable one that says a great deal for Robert Stevenson, the engineer in charge of the whole operation, and for the men who worked under him.Full details of the history can be had at the Signal Tower Museum. The lighthouse tower was constructed of four separate types of stone. The eighteen irregular foundation stones were of granite from Cairngall Quarry near Peterhead. These were formed to fIt holes cut in the bedrock to provide a level foundation. The main tower had an outer skin of granite from Rubislaw Quarry near Aberdeen and a core of old red sandstone from Mylnefield Quarry, Kingoodie. The cornice and parapet wall round the light were cut from sandstone from Craigleith Quarry near Edinburgh. 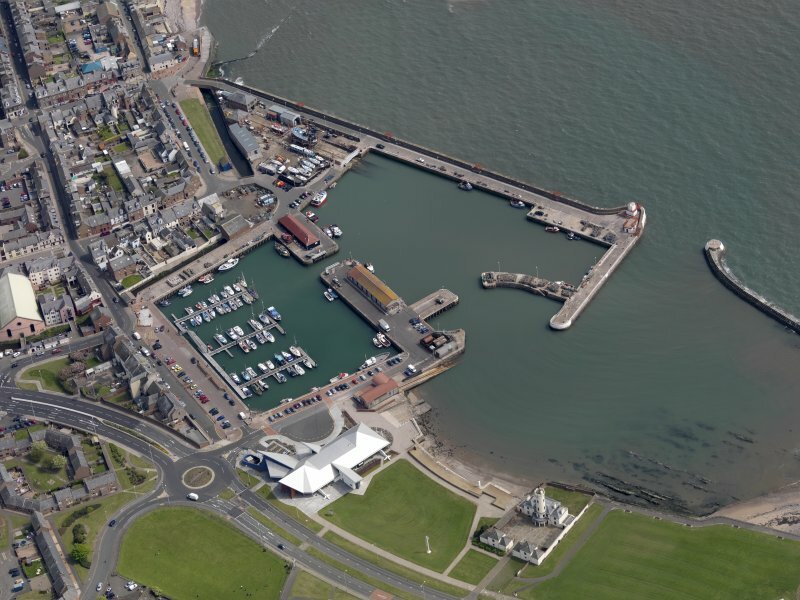 The quarry blocks were transported to Arbroath by sea and taken to a yard in Ladyloan, due north of the Signal Tower and half-way between it and the harbour. 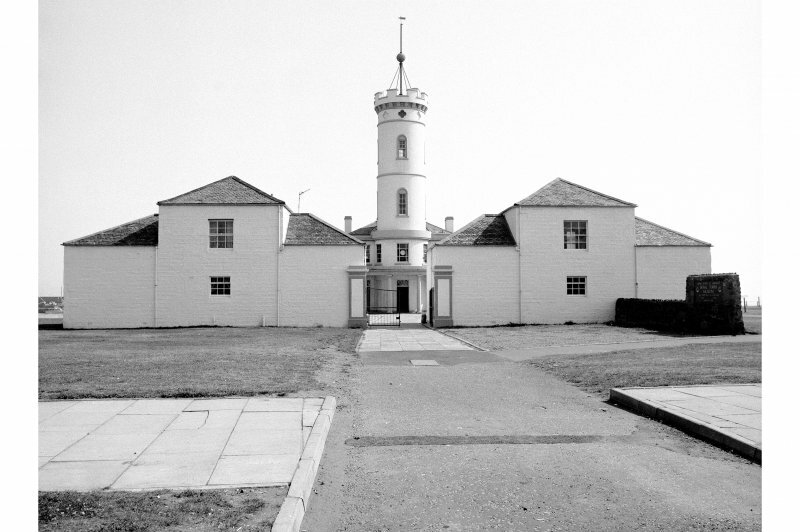 The yard contained a circular masonry platform corresponding in size to the base of the lighthouse tower. Each course of masonry was tested on this before being marked with oil paint and stacked ready for shipping to the site. The yard had workmen's shades round three sides. 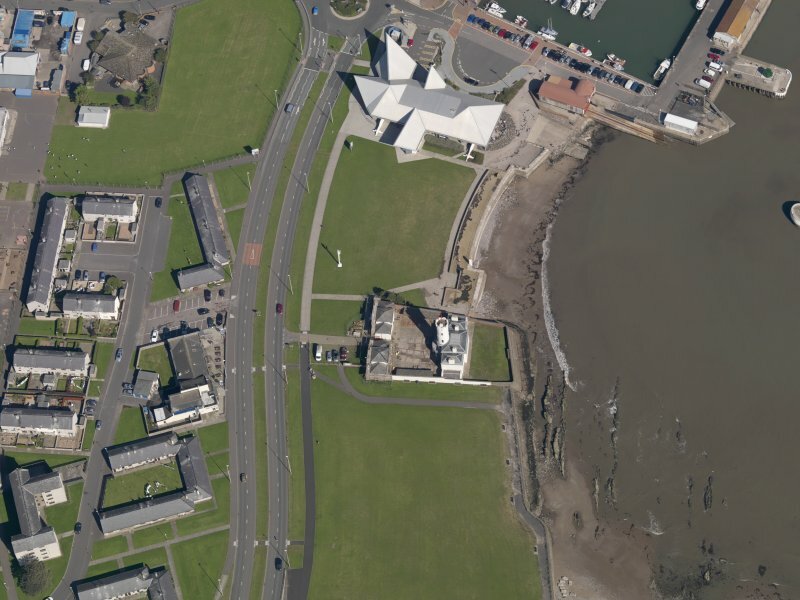 The fourth side contained the barracks which backed onto Hannah Street.During the building season the stones were returned to the harbour and shipped to the site. Each ship had its own mooring near the rock and the stones were transferred the short distance from the moorings to the landing stage by a form of small boat known as a praam. The stones were unloaded from the praams onto a raised railway to be carried across to the base of the tower. They were then twisted into position by a series of cranes, the last of which was a balance crane used for the final placement. It was the forerunner to present-day tower cranes but had a double jib and a mobile balance weight to counteract the weight of the stone. The men working on the rock were quartered in one of the tenders but, as work was speeded up, they were moved, fIrst into the temporary lightship, the Pharos, then into the Sir joseph Banks, a ship purchased specifIcally to fulfIl this function. Work was carried on at any time of the night or day when the site was accessible. Bad weather created most of the major problems and, as large waves are capable of moving enormous weights, all stones landed had to be properly positioned and clamped before the end of that particular shift. As soon as the lighthouse tower was complete the platform in the Bell Rock Yard was dismantled and the stones built into the Signal Tower. The Signal Tower occupies a seafront site so close to the sea that the keepers' drying greens were retained by the sea wall. 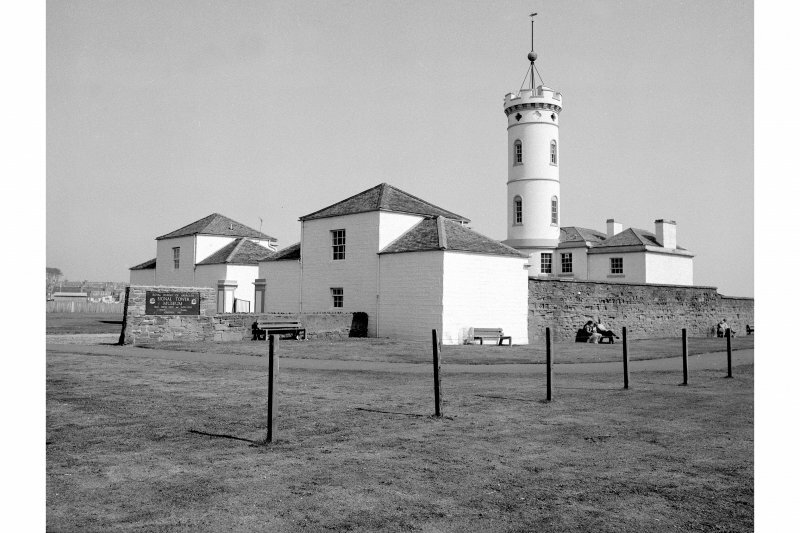 The accommodation provided was intended to house the Principal Lightkeeper, the Principal Assistant Lightkeeper, the Master of the Lighthouse Tender and three other assistant Lightkeepers and their families. The tower had a 1.5m achromatic telescope housed in a small observatory. Over this was a flagstaff on which was mounted a 46cm copper sphere. This was used for communication between the lighthouse and the shore. The ball on the lighthouse was raised at a particular time each day if all was well, but if there were problems the ball was left unraised. In this event the tender put to sea immediately. A pair of carrier pigeons was also used to transport messages. The pigeons were presented by Captain Samuel Brown, RM, who built the suspension bridge at Montrose, now demolished. The pigeons took an average time of only eleven minutes to fly the 19.2km between the lighthouse and the Signal Tower. Both floors of the building are stone flagged and originally the-windows were fItted with storm shutters. The houses had a detached garden in Millgate Loan now occupied by the Mount Zion Brae. 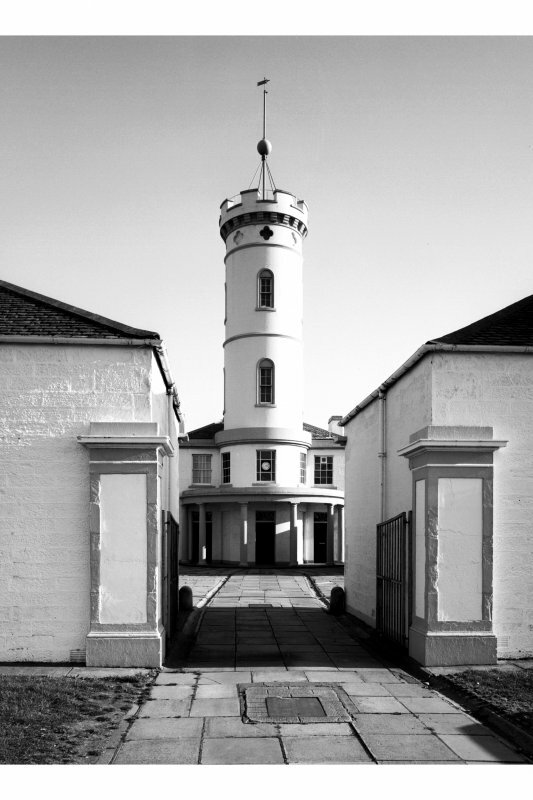 The keepers' accommodation was moved to Salvesen Crescent, Edinburgh, in the 1950s and Arbroath's link with the Bell Rock was broken. This building presently houses the Signal Tower Museum, administered by Angus District Council. 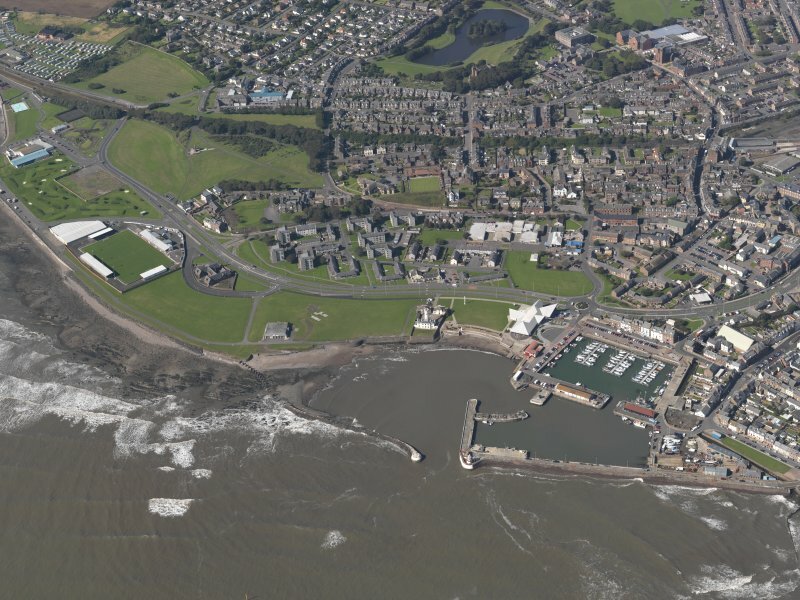 There are seven exhibition rooms covering various facets of Arbroath's rich history: the early history of man in the area; the medieval period when the Abbey was built; the design and construction of the Bell Rock Lighthouse; the Arbroath fIshing community; the natural environment; civic history and local public services; local industries including flax spinning and weaving, shoemaking, clockmaking, agricultural machinery and mechanical engineering; there is also a gallery of everyday life. 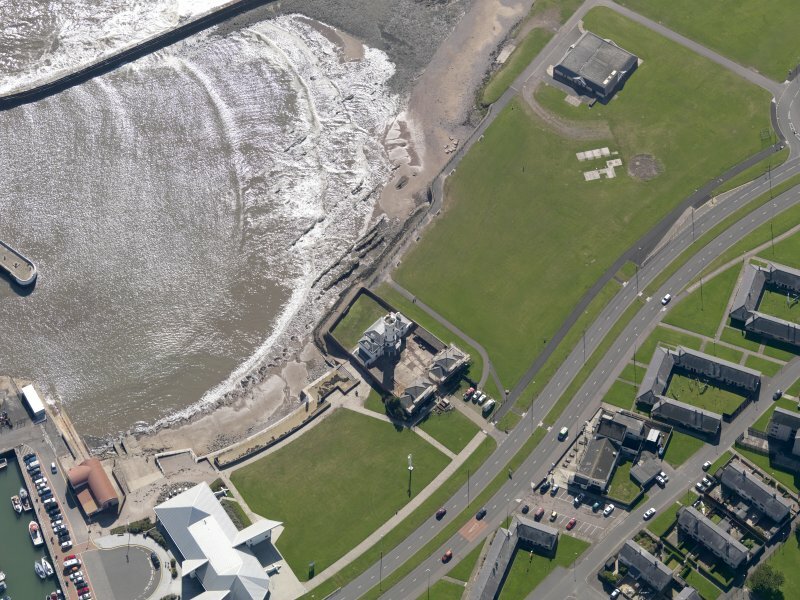 The museum was opened in 1974 and was the Scottish Museum of the Year in 1975.
to and from the station, Northern Lighthouse Board vessels and the lighthouse 11 miles distant from the shore. Engineers will be fascinated to note that the signal book includes Robert Stevenson’s own flag to be flown when he was aboard the lighthouse vessel. Now an Angus Council Museum (01241 875598). newly re-roofed in Carmyllie flagstone.